Washing your car every week is a chore and can be very time consuming. Between our busy work schedules and family time it is difficult to find the time for things like washing our car. Quick Detailing is a simple solution that cuts down your regular washing routine by maintaining your car's paint when it is just lightly dusty. Just a few minutes a day or every other day will keep that just detailed look! The quick detail spray market was created in 1981 by Meguiar's who released a product called Meguair's Trigger Wash. After realizing the name caused some confusion with consumers, Meguiar�s changed the product name to Meguiar's Quik Detailer. The product completely defined a new market and remains one of Meguiar�s top sellers. Quick detailers, which are often called waterless washes, are commonly used by detailers and car enthusiasts to put the finishing touch on a freshly detailed vehicle. Quick Detail Spray products quickly and easily remove water spots, streaks, dust and other light contamination. The special formulations evaporate quickly to prevent further spotting, lubricate to prevent scratching and contain gloss enhancers to refresh your just waxed shine. Today, every major car care brand has a quick detailer or waterless wash type product in their line-up. For the car enthusiast, a quick detailer is more than just a convenience; it is a necessity and part of their car care routine. Done properly, quick detailing can reduce the amount of time you spend cleaning your car. It also reduces the effects of harmful elements (road grime, bird droppings, bugs, etc. ), and keeps your car looking sharp. Ten minutes every day or every other day is all it takes to maintain a great looking finish. Quick Detailing is not just for the exterior of your car. There are detailing sprays for your car's interior as well. Sonus Cockpit Detailer or the multi-use Ultima Detail Spray Plus are excellent interior detailers. They will remove dust, fingerprints and light soil from all non-fabric surfaces. About three to four times per year you should clean and protect your interior, but that is simply not enough to keep your interior fresh and clean. A few years ago due to the popularity of the exterior quick detailer, a new interior quick detail emerged. The idea is about the same as the exterior quick detailer, just mist and wipe to maintain freshly detailed interior look. To use an interior detailing spray, fold your microfiber detailing towel, spray it with a few shots of detailing spray, and wipe down the dashboard, console and leather seats, door panels and door jambs. The interior detailing spray was made more for dusting than cleaning, just as the exterior spray, it is a maintenance product and is not meant to replace interior cleaners or protectants. 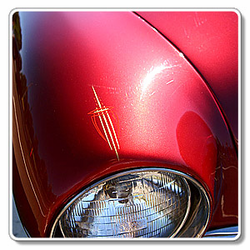 The number one concern most people have with quick detailing is scratching or dulling the paint. This is a genuine concern and warrants discussion. If in doubt, if you think your car might be too dirty, don't quick detail, wash it instead. Paint Condition: To prevent scratching and swirl marks, a Quick Detail Spray should not be used to clean large areas with heavy dirt. If in doubt or when heavy dirt is present, wash your vehicle with quality car wash shampoo. Start at the top and work your way down to the lower surfaces of your car. Holding the Quick Detail Spray 12" to 15" away, lightly mist about a 2' by 2' area on the surface of your car with a Quick Detail Spray like the Ultima Detail Spray Plus, one of the Sonus Quick Detailing Sprays, McKee's 37 High Gloss Detail Spray, or Pinnacle Crystal Mist. PRO TIP! For that flawless, just detailed look after washing your car, use a quick detailer to eliminate any streaks, spots and enhance the gloss. The Final Touch to a Perfect Detail!